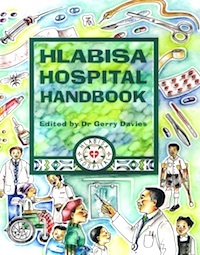 The "Hlabisa Hospital Handbook" is an essential desktop reference book for every community service doctor, medical officer, or medical student who serves in any rural district hospital in South Africa. Generalist doctors in rural hospitals are called upon to deal with a vast spectrum of disease and pathology, which can be overwhelming to the recent graduate or newcomer from overseas, who is "thrown in at the deep end" with little or no supervision. Local clinical management protocols have not been compiled in may institutions, and medical staff make their own decisions without standardized treatment guidelines. Standard medical textbooks often suggest investigations and management plans that are unavailable in rural areas. This handbook aims to fill this gap, and provide simple and practical guidelines for the commonest clinical conditions in tropical southern Africa. Written specifically for the context of Hlabisa Hospital in KwaZulu-Natal, the handbook's approach in management to a wide range of conditions is nevertheless applicable to similar rural hospitals in other regions of the country. Dr. Gerry Davies, a physician from the U.K. with four years experience in rural practice, has included all the clinical management protocols that he would have liked to have known when he started at Hlabisa, including a section on the Zulu language. He has drawn on the accumulated experience of a wide range of colleagues, and in this way has extended the scope of the material. This book is an extremely valuable resource for young doctors, and provides a baseline baseline that can be adapted for use in district hospitals in other contexts. In the deep end, the "Hlabisa Hospital Handbook" is a lifeline. Thanks to Therese Hansen and Africa Health Placements, a not-for-profit project placing doctors in rural hospitals in Sub-Saharan Africa, for making the redistribution of this book possible.